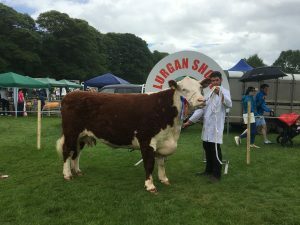 Ciaran Kerr’s Mullaghdoopoll 1 Elite claimed his second supreme championship on home turf at Lurgan Show on Saturday under the expert eye of judge Robin Irvine closely followed by Lusky 1 Honour, a cow with calf at foot owned and bred by John Gill. 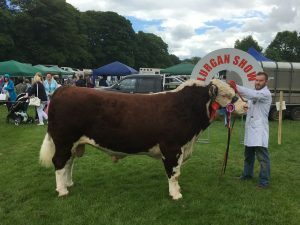 Other class winners on the day included Mountview Enzo owned and bred by Trevor Andrews taking the intermediate bull class. 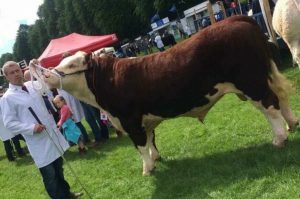 Another win was secured by Greer Watson in the senior Heifer class with Barnburn 1 Marigold whilst the strong yearling class was won with a heifer Corraback Joan 15th now owned by Courtney Halliday. Cairan Kerr managed to secure a one,two in the final class of the day with Kinnego 1 Pharaoh taking first and President coming second.